후진(後秦)의 구마라습(鳩摩羅什)이 번역한 범망경과 금강반야바라밀경을 한 책으로 묶은 것이다. 세로 24.5㎝, 가로 15.2㎝ 크기로 되어 있으며 목판에 새긴 뒤 닥종이에 찍은 것이다. 범망경의 원래 명칭은 '범망경노사나불설보살심지계품' 또는 '범망보살계경'으로, 자기 안에 있는 부처님의 성품을 계발하는 것을 목적으로 하는 불경이다. 금강반야바라밀경은 줄여서 ‘금강경’이라고 부르며, 조계종의 근본경전으로 우리나라에서는 반야심경 다음으로 널리 읽히는 경전이다. 금강반야바라밀경에는 천로(川老)가 지은 송(頌:찬양하는 글)이 붙어 있으며, 끝부분에는 고려 우왕 13년(1387)에 유향과 강인부가 왕비에게 청하여 판을 새기게 되었다는 내용의 발문(跋文:책의 끝에 내용의 대강과 그에 관련된 일을 간략하게 적은 글)이 있다. 지담(志淡)이 판을 새기고, 발문은 이색(李穡)이 짓고 글씨는 각지(角之)가 썼다는 기록도 있다. 범망경에는 간행 기록이 적혀있지 않아 자세한 내용을 알 수 없으나, 두 불경의 종이질이 같은 것으로 보아 같은 시대에 찍어낸 것으로 보인다. This book was published by combining Brahmajala Sutra (Sutra of Brahma’s Net) and Prajnaparamita Sutra (Diamond Sutra) translated by Kumarajiva of the Later Qin. Printed on mulberry paper using woodblocks, it measures 24.5 cm long and 15.2 cm wide. Brahmajala Sutra aimed to develop the Buddhist nature inside oneself. Vajracchedika prajnaparamita Sutra, popularly known as the Diamond Sutra, is a canonical scripture of the Jogye Order of Korean Buddhism and is the second most read sutra in Korea after Maha prajnaparamita hridaya Sutra (Heart Sutra). 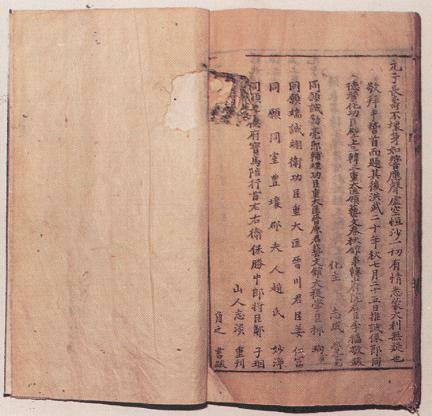 A praise written by Chuanlao, a Buddhist monk of the Song Dynasty, is attached to Vajracchedika prajnaparamita Sutra. 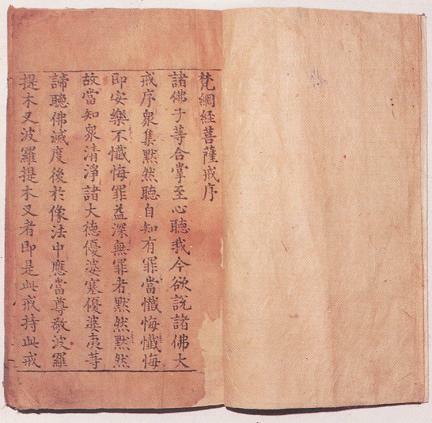 At the end of this sutra is a record stating that woodblocks for printing this sutra were carved at the request of Yu Hyang and Kang In-bu to the queen in 1387 (13th year of the reign of King U of the Goryeo Dynasty). Brahmajala Sutra does not have any record on its publication date, but the two sutras seem to have been published during the same period based on the similar paper quality of the two.